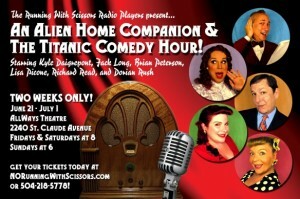 Running w/ Scissors presents: An Alien Home Companion & The Titanic Comedy Hour! Travel back in time — before the internet, before television, before Americans knew words like OMG and LOL and Kardashian. 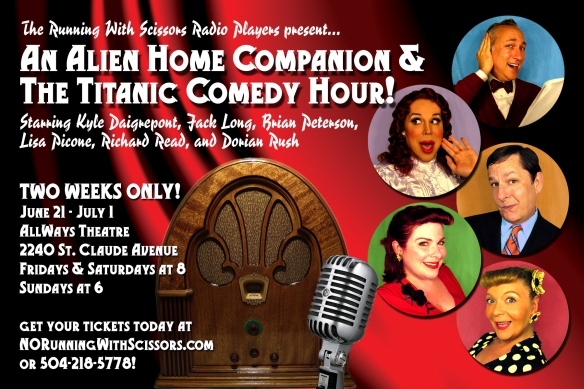 Join us in this heady era, when queens were queens and radio was king, as the Running With Scissors Radio Players present a hilarious, action-packed double-bill: An Alien Home Companion & The Titanic Comedy Hour! In its characteristically camped-up style, Running With Scissors has reimagined these two cinematic blockbusters — Alien and Titanic — as radio plays, performed by a dedicated troupe of young(ish) starlets, Broadway washouts, and at least one diabolical diva. Watch as this motley mob of half-baked hacks drags listeners to the furthest reaches of the universe to fight a surprisingly civilized alien menace. Tag along onboard the Titanic, as they tell a tawdtry tale of class warfare, forbidden love, and Celine Dion. Will these beloved cinematic stories change in Running With Scissors’ hands? Darned tootin’ they will — and how! An Alien Home Companion & The Titanic Comedy Hour (Presented by the Running With Scissors Radio Players) stars Kyle Daigrepont, Jack Long, Brian Peterson, and Dorian Rush, with a special guest appearance by Richard Read. Performances will be held at the AllWays Theatre, 2240 St. Claude Avenue, at the corner of Marigny Street. Shows run Fridays and Saturdays at 8pm and Sundays at 6pm for two weekends only: June 22 – July 1. Tickets are $20 on Fridays and Saturdays, $15 on Sundays and can be purchased at www.NORunningWithScissors.com or by calling 504 606 9903. The Mystic Krewe of Satyricon hosts a special opening night performance on Thursday, June 21 at 8pm. Tickets are $20 and can be reserved at 504 943 6910.